Swipe Technologies, pioneers in offering new tablet technologies and innovative solutions, today, announced the launch of Swipe Sense, India’s first ultra thin 5.5 inch phablet with a physical bio-metric sensor. It is the perfect fusion of art and technology, being the thinnest phablet in its class at just 7.8 mm thinness. It is also one of the fastest devices in its category in India. It is also the only phablet in the country to come with so many path breaking features at a cost effective price. 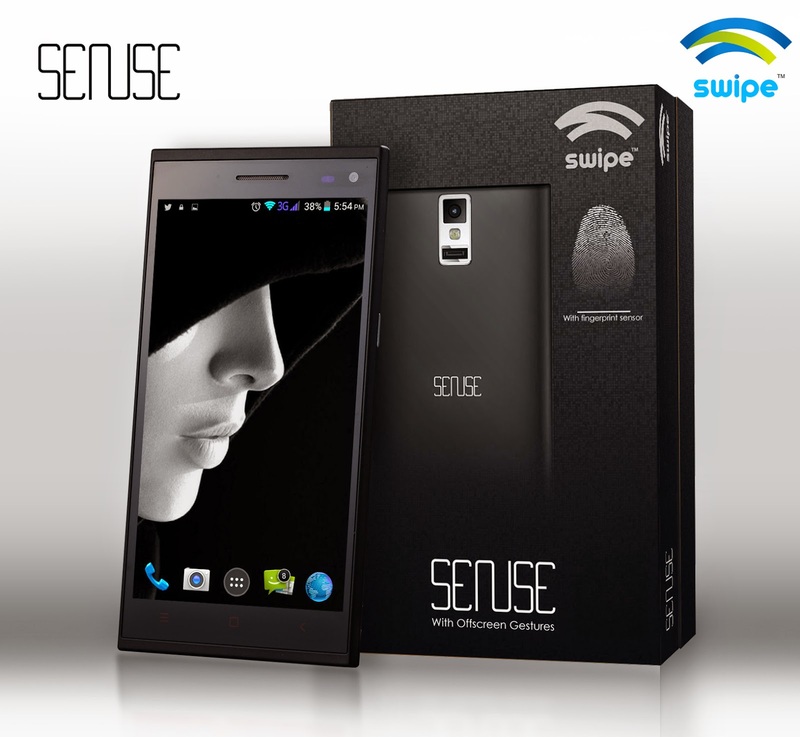 It is the only phablet in its class with a built-in fingerprint sensor for enhanced security. It has a patented sensor with extra sensitive receptors to record even the minutest differences in fingerprints, turning your smartphone into a security vault. You can also configure different functions for different fingers on this conveniently placed piece of hardware on the backside of the phone. The phablet also comes with an innovative gesture control mechanism that lets users control their phone just by using gestures even with the screen turned off. Users can even design their own gestures and assign them to a task of their choice. Superior sensor technology on the device is on 'always on' mode, and recognizes preset gestures in nanoseconds, letting the user use the phone in the hands-free mode for every task. The device has a gorgeous 5.5 inch qHD screen with a resolution of 540x960 pixels. Designed for spectacular viewing, the phablet puts the definition in High Definition! It is fueled by a 1.3 GHz Mediatek quad core processor for exceptional performance. Running the latest Android 4.4.2 Kitkat, the phablet delivers the smoothest performance in its class. A 2250 mAh battery ensures that the user does not run out of power for hours. To make the deal irresistible, it comes with an additional 2250 mAh battery, in the box, absolutely free! In the age of social media, photography is indispensable, which is why this device is equipped with an 8 MP precision rear camera for higher depth and superior dynamic range. It excels at night shots, thanks to its powerful flash. A 3.2 MP front camera guarantees high-quality selfies and seamless video calling. The user can save pictures, videos and other multimedia with the 8 GB in-built memory, which is expandable up to 32 GB. It also boasts of seamless connectivity as it is compatible with 3G, 2G, Wi-Fi, Bluetooth, GPS/AGPS and even OTG support.